The cyanobacterial clock proteins KaiA and KaiB are proposed as regulators of the circadian rhythm in cyanobacteria. 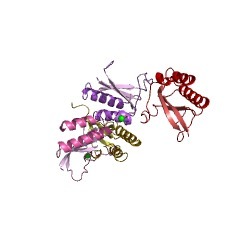 Mutations in both proteins have been reported to alter or abolish circadian rhythmicity. KaiB adopts an alpha-beta meander motif and is found to be a dimer (PMID: 15071498). The cyanobacterial clock proteins KaiA, KaiB and SasA are proposed as regulators of the circadian rhythm in cyanobacteria [(PUBMED:12441347), (PUBMED:12727878)]. 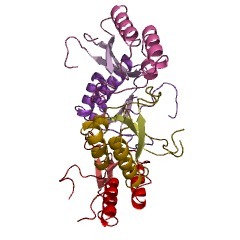 Mutations in both proteins have been reported to alter or abolish circadian rhythmicity. KaiB adopts an alpha-beta meander motif and is found to be a dimer [(PUBMED:15313603)]. KaiB was originally discovered from the cyanobacterium Synechococcus as part of the circadian clock gene cluster, kaiABC. KaiB attenuates KaiA-enhanced KaiC autokinase activity by interacting with KaiA-KaiC complexes in a circadian fashion [(PUBMED:15071498), (PUBMED:12727879)]. KaiB is membrane-associated as well as cytosolic. The amount of membrane-associated protein peaks in the evening (at circadian time (CT) 12-16) while the cytosolic form peaks later (at CT 20). The rhythmic localization of KaiB may function in regulating the formation of Kai complexes. 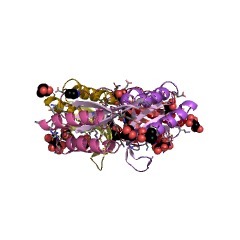 SasA is a sensory histidine kinase which associates with KaiC [(PUBMED:10786837)]. Although it is not an essential oscillator component, it is important in enhancing kaiABC expression and is important in metabolic growth control under day/night cycle conditions. 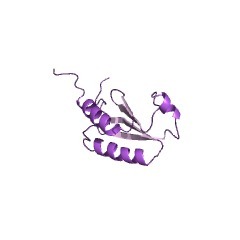 SasA contains an N-terminal sensory domain with a TRX fold which is involved in the SasA-KaiC interaction [(PUBMED:12449424)]. This domain shows high sequence similarity with KaiB [(PUBMED:15014139)]. 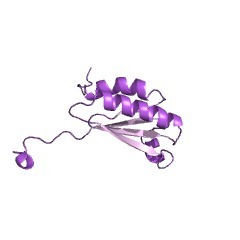 However, the KaiB structure does not show a classical TRX fold. The N-terminal half of KaiB shares the same beta-alpha-beta topology as TRX, but the topology of its C-terminal half diverges. There are 1766 KaiB domains in 1766 proteins in SMART's nrdb database. Taxonomic distribution of proteins containing KaiB domain. This tree includes only several representative species. The complete taxonomic breakdown of all proteins with KaiB domain is also avaliable. Click on the protein counts, or double click on taxonomic names to display all proteins containing KaiB domain in the selected taxonomic class. Anabaena circadian clock proteins KaiA and KaiB reveal a potential common bindingsite to their partner KaiC. The cyanobacterial clock proteins KaiA and KaiB are proposed as regulators of thecircadian rhythm in cyanobacteria. 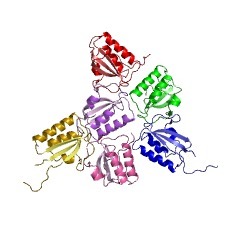 Mutations in both proteins have been reported to alter or abolish circadian rhythmicity. Here, we present molecular models ofboth KaiA and KaiB from the cyanobacteria Anabaena sp PCC7120 deduced by crystal structure analysis, and we discuss how clock-changing or abolishing mutations maycause their resulting circadian phenotype. The overall fold of the KaiA monomeris that of a four-helix bundle. KaiB, on the other hand, adopts an alpha-betameander motif. Both proteins purify and crystallize as dimers. While the folds ofthe two proteins are clearly different, their size and some surface features ofthe physiologically relevant dimers are very similar. 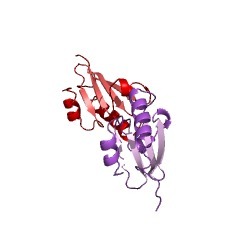 Notably, the functionallyrelevant residues Arg 69 of KaiA and Arg 23 of KaiB align well in space. Theapparent structural similarities suggest that KaiA and KaiB may compete for apotential common binding site on KaiC. 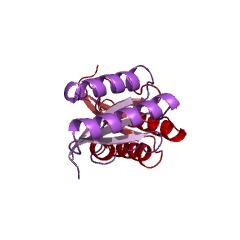 1wwj crystal structure of KaiB from Synechocystis sp.